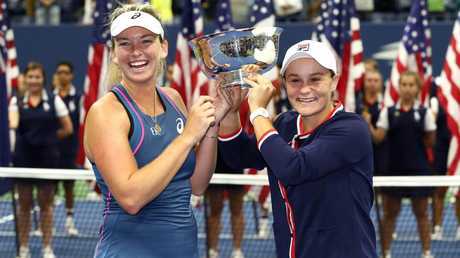 AUSTRALIAN tennis star Ashleigh Barty has landed her maiden grand slam title, teaming with American CoCo Vandeweghe to win a thrilling US Open women's doubles final in New York. Barty and Vandeweghe saved three match points to edge out second-seeded Australian Open champions Timea Babos and Kristina Mladenovic 3-6 7-6 (7-2) 7-6 (8-6) in the first-ever women's doubles grand slam final decided in a third-set tie-break. Barty had lost all four grand slam doubles finals with retired compatriot Casey Dellacqua, falling short at the Australian Open, Wimbledon and the US Open in 2013 and at last year's French Open. Barty's triumph completes a memorable US Open for the Queenslander. The sporting super talent also reached the fourth round of the singles, marking the first time the former Wimbledon junior champion and WBBL cricketer had made the second week of a slam. The new world No. 15's earnings for the fortnight totalled $1.16 million - $662,000 for singles and $498,000 for doubles. "It's very humbling," she said. Barty is the seventh Australian to win the US Open women's doubles title, joining four-times champion Margaret Court (1968, 1979, 1973, 1975), Judy Tegart-Dalton (1970-71), Wendy Turnbull (1979, 1982), Hana Mandlikova (1989), Rennae Stubbs (2001) and Samantha Stosur (2005).